Fresh off the rejection train from Blacklibraryville, and here submitted for your approval, my pitch for the open door, and the 500 words of example writing. First up, the opening pitch, comprising at most a couple of sentences that nevertheless fully encapsulate every element of the excitement, action and adventure that I’m trying to get across; outlining the situation, the protagonists, the goals and the consequences of failure. No pressure there. KILLING RUNE is the Saint-Nazaire commando raid, in space. Chaos tainted interstellar pirates plot to unleash daemonic forces from within the wandering moon base they call Rune, and when these pirates emerge from hiding in a backwater, best forgotten system, only Kale von Balen, disgraced planetary defence officer, is there to stand in their way. With Imperial support still sectors distant, Kale leads an improvised assault group on a could-be-suicide collision course mission to avert disaster, repair a tattered reputation, and destroy the pirate moon. As might be obvious from that, I got the idea from the Second World War combined operations mission against Saint-Nazaire, known as Operation Chariot. A bold as brass raid on the only dry dock capable of servicing the German warship Tirpitz, Operation Chariot involved ramming a boat full of explosives into the dock gates at Saint-Nazaire. And that was just the start of the operation. I thought it might be interesting to recreate this kind of daredevil exploit in terms of Warhammer 40K and the eternal struggle against Chaos. Along with the pitch, Black Library wanted some words to show that you could string a sentence together. I’m fairly happy with what I wrote for this part, although to be honest I endlessly tweak my writing so I’d probably go over this a few more times if it was going anywhere. On the first morning, Kale had the non-coms bring their candidates out to the training camp at Kerrows’ Barracks. Put them through their paces and let Kale see what they had to work with sort of deal. The camp had acres of assault courses, cross-country tracks, firing ranges and tunnel-trench systems for practicing attack-and-defence in field conditions. The whole place blanketed by cameras and sensors, monitored from a command centre in a grey-block building beyond the distant trees and far from the action. Kale ignored the high-tech trappings; better to see the dirt and smoke of the live fire lanes. You needed to breathe in the aggression and the fury. Meeks, local boy, stood with Kale on the side-lines, holding a sheaf of flimsy papers in one gloved fist. Now and then, Kale heard Meeks reacting, trying to be quiet but not doing well. Intake of breath. Click of teeth. Unit Two, hammering down a narrow defile between two bunkers when a servitor gun-carriage popped from the mud and tagged them all. That drew a snort from Meeks. The snap-snap-snap of heavy projectile weapons echoed off the high dirt berms surrounding countless separate attacks and counters. Here and there the crackle of lasgun blasts. Twists of pale smoke drifted over the confusion. Now and then, however, trouble shows up at your door, Kale thought. Meeks may have been tutting at this point. A masterful selection of noises the man produced. Truly a marvel for the ages. “Outside of vid. Very few,” Meeks said. If Kale was not mistaken, Orffen was the current play-dead leader of Unit Two. Perhaps near-zero grav would prove to be her natural habitat. So there you have it. My unsuccessful attempt at getting to write 40K fiction. I look forward to trying again the next time the door is open. Needless to say I’ve not been back to my blog for ages, and haven’t even got around to my #RPGaDay 2018 final answers and thoughts post. Still, maybe sometime this month, eh? Except it isn’t because I haven’t done the day 31 question or the ‘in summary’ post I was intending to do at the weekend. Hopefully get back to that in the next day or so. Day 30: Something learned about playing your character? I guess what I’ve mostly learned over the years is that there are no small characters or minor roles. I can’t really do ‘throw away’. As soon as the numbers are down or the concept is imagined, that character is–for me at least–a living, thinking being with a purpose. I want to see how they respond to the world, where they go and how they get there. Question 29: Share a friendship you have because of RPGs? My oldest friendship exists because one day in 1983 or ’84 I went to the local Model Shop (which sold model kits of tanks and such and also roleplaying games and computers) and asked if they knew anyone who was a gamer? They knew just the fellow, who showed up a few days later with a character sheet all prepared and invited me to join his group for their latest AD&D campaign. The rest is hundreds of characters over decades of games. There are very few people I know now that I didn’t meet through roleplaying games, or via people I’d met through gaming. Funny how that turned out. Question 28: Inspiring gaming excellence for which I am grateful? Always impressed/awed by the work of Kevin Crawford and his Sine Nomine Publishing. Fantastic releases like Stars Without Number, Silent Legions, and Scarlet Heroes, that are not only incredible games in their own right but also provide endless sandbox material for other games and adventures. I can’t think of a game I’ve run in the last couple of years where I haven’t used at least one of the many tables from the Kevin Crawford game books. In a recent Dolmenwood game, the party were attacked in the forest by a band of creatures whose claws had the power to paralyse. In short order, seven or eight of these fiends laid waste to the rest of the group, with the other three quickly down and out for the count, until my character stood alone to face the monsters that remained. As luck would have it, Elves are immune to the paralysis, and thus despite being clawed up he was able to kill the rest of the attackers. If not for that immunity the whole team would probably have been wiped out. In week three. Day 26: Gaming ambition for the next 12 months? I want to run the new iteration of Runequest aka Runequest Roleplaying in Glorantha. Not sure how that will fit in to the current gaming plans of the group, but that’s the plan anyway. Day 25: Name a game that had an impact in the last 12 months? For sheer entertainment value, it has to be Shadowrun. There’s probably a more serious and thoughtful answer, but not right at this moment. Question 24: Which RPG do you think deserves more recognition? 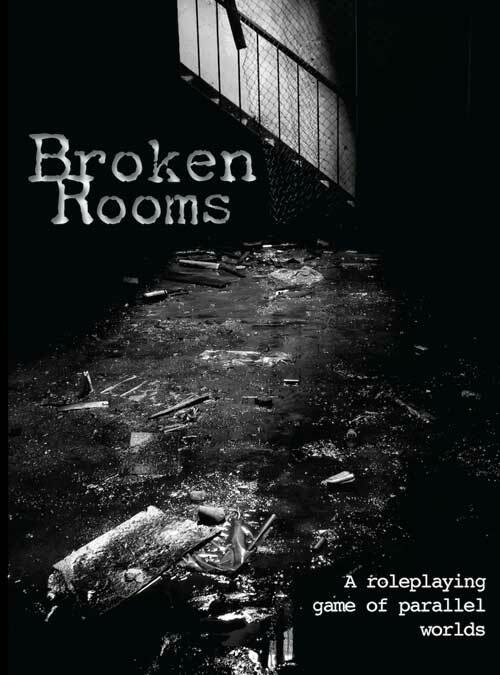 I’d have to say Broken Rooms, a game of parallel worlds by Stephen Herron and published by Greymalkin Designs. It’s all bad news, but still tremendous entertainment, with plenty of depth and heart. Oh, yeah, I wrote some bits of the game, so look out for those.